Japanoise at it’s best, don’t miss a rare opportunity to see Melt Banana play this May 27th at the Rainbow Warehouse in Digbeth. Advance tickets are available now from here & will cost you less than on the door on the night. 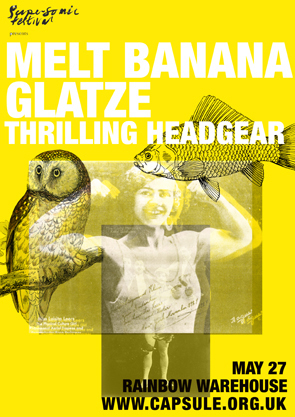 Support comes from THRILLING HEADGEAR and Sam Underwood’s ‘nutjob’ solo project GLATZE. For more information about all of these acts and to sample tracks read our preview.